Hi there - it's Memorial Day here in the US, and we spent the day with family and friends remembering those that gave so much, so that we can enjoy our freedom. This is one of my favorite days to live in my neighborhood. Each year, there is a parade filled with War Veterans, fire trucks, bag pipers and girl scouts that passes by our house. All the houses along my street decorate with festive red, white and blue, and American Flags sway in the breeze. It's perfect small-town living. 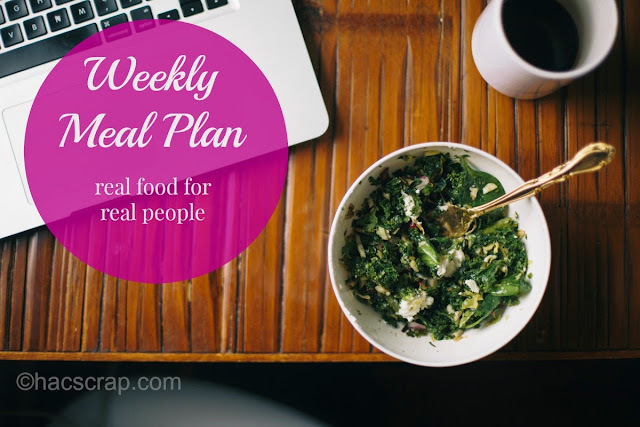 But it's also Monday, and while it may be late, I still have a menu plan for the upcoming week. Spring sports are winding down and we all have summer on our minds. It's supposed to be a hot week around here, so I'm taking it a little easy and firing up the grill. 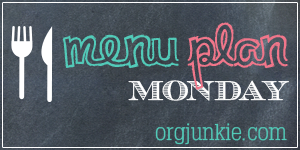 This post is linked up for Menu Plan Monday at I'm an Organizing Junkie. Check it out for more meal planning ideas and inspiration. After checking out your Shrimp, Steak & Veggie kabobs, I find myself wishing I had shrimp & steak on hand to make these. I hopped over from Organizing Junkie. Have a wonderful day! Enjoy your reunion. Sounds like fun. Your menu sounds delicious! I bet leftover night will be especially great!